2017 was an exciting and adventurous year for Exquisite Events! Amidst speaking engagements and design walk through which took us to Dubai and Korea, Nikki also managed to get some time to vacation in her favorite cities, Paris and Barcelona where she also checked out a couple of hotels for her future brides considering exotic locals for their destination weddings. Even though there were many events, here are some of our favorites of 2017 produced by Exquisite Events! February was dedicated to an exclusive event which took place at Montage Beverly Hills. About sixty guests were treated to a fabulous evening of stunning décor, gourmet food, great music and unparalleled ambience. Needless to say guests were floored and enjoyed this evening to the fullest. Photography by Mike Colon. Our first wedding of the year was a Pakistani Wedding of Zara and Danyaal which took place at Casa del Mar in Santa Monica. Sangeet and Mehndi night was infused with color per bride’s inspiration and had an ethnic look and feel about it. This destination wedding festivities began with Groom’s family carrying Mehndi trays decorated beautifully, carrying fruits and sweets and gifts for the bride. A drummer accompanied them and soon after amidst pomp and circumstance, our bride made her entrance. There was a lot of dancing from both sides and the night was enjoyed by everyone in presence. Photography by Luna de Mare. 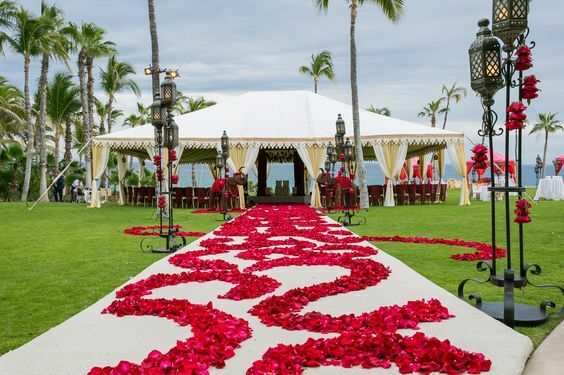 Next day was the ceremony and reception took place at the Four Seasons Beverly Hills. Groom arrived with his family in a Baraat procession and was led to the stage where the ceremony took place. The bride walked down the aisle on the arms of her father while the sitar player played the iconic dirty dancing tune. A short Muslim ceremony ended within fifteen minutes and guests made their way to the cocktail hour where they were entertained with live sitar player. They were then escorted to the ballroom which was all done in blush, cream and gold accents. With hundreds of candles flickering and mood lighting done to the nines, it set the tone for a very elegant evening. Couple made their grand entrance and went to the dance floor for their first dance. The night was festive, fun and jovial and dance floor stayed packed the entire night. Photography by Luna de Mare. 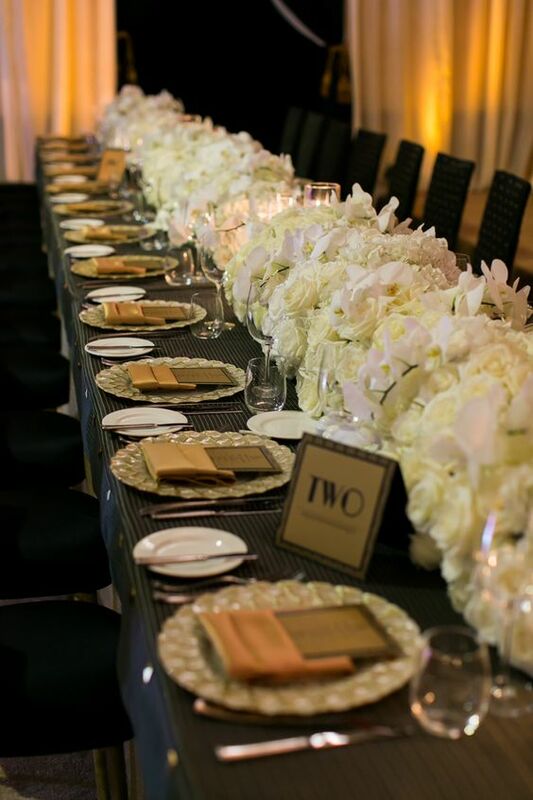 Month of May, Exquisite Events entertained a few guests to the Four Seasons Beverly Hills and collaborated with Jeff Leatham and Edgar Zamora. Needless to say with these two giants in the industry the night was nothing short of spectacular. Guests were treated to a magical evening starting at Jeff’s studio with the sitar player perched high on a riser and playing magical tunes. They were then escorted up on the main floor for dinner where our duo was playing French music, gourmet four course meal was served that ended with a decadent dessert display. This certainly was a night to remember! Photography by Mike Colon. We went off to the Bay Area for Sonia and Shaan’s wedding. The Sangeet took place at Fairmont San Jose and the room was decorated with coral and pink and had an ethnic feel to it. Raj Tents set up pergola tents which housed the bars and DJ booth. With all the new furniture that was shipped specially for the event, this room we were told by the hotel staff had never looked this beautiful. Sonia and Shaan enjoyed the night with their families and friends to the hilt and guests had a feast with various food stations set up in the ballroom. Photography by Matei Horvath. Couple’s ceremony was one day later at Ritz Carlton Half Moon Bay. Friday was spent in setting up the ballroom with carpeting, draping and lighting since Saturday was going to be a busy day with five back to back events. Bride wanted a very ethereal and organic look for her Mandap and chose a very open structure so not to inhibit the view of water. Groom arrived on a decorated golf cart at the Baraat procession. Ceremony was seamless and guests were then escorted for lunch. Exquisite Events team got busy with setting up the cocktail area which was going to take place at the ceremony site. All white furniture and a big round white bar was placed on the lawn with high and low boys covered in white linens. White flowers and tons of candles further enhanced the ambiance. Ballroom looked absolutely magical with long and round tables. Couple’s stage backdrop was candle walls embellished with flowers and candles. Since bride wanted to keep a very understated elegant feel, most of the flowers were low except for the long tables. A green magnolia leaf chandelier hung above the dance floor. Our ravishing bride wore red and added the perfect pop of color with the groom looking dashing in his black suit. The night festivities lasted until the early morning hours. Photography by Matei Horvath. September was the month Paris and Alex had chosen for their Pelican Hill Wedding. Their 300 guests ceremony took place at the Rotunda Lawn and the other half of the lawn was decorated for the cocktail hour. Our beautiful bride’s inspiration was very European. The Rotunda was draped in ivory billowy chiffon and the chivari chairs were also covered in ivory chiffon. The eight piece orchestra played strings as guests took their seats. Our lovely bride in Vera Wang looked stunning while our groom looked dashing in his Ralph Lauren suit. Ceremony was touching and meaningful and at the conclusion guests made their way to the back of the lawn for cocktail hour where servers stood in line carrying glasses of champagne. Guests enjoyed listening to the orchestra, full bar and delicious hor d'oeuvres. Our decadent dinner was set up on the Mar Vista lower patio and exuded European charm. With dozens of chandeliers hanging above guest tables, stage backdrop for the band, behind couple’s head table and hundreds of candles flickering, end effect was pure romance. Our couple made their grand entrance from the stair case which was lined with lanterns and proceeded to do their first dance. The band played beautiful, nostalgic music while guests noshed on filet and lobster four course meal. Cake cutting indicated time to move up to the Mar Vista Ballroom for after party where a full bar, decadent desserts and the band and DJ awaited them. This after party lasted until 1 am and like all good things must come to an end, this night ended on a high note. We formed such amazing bond with this couple and their families and consider it our good fortune to know them. Photography by Lost in Love. The last wedding of the year was also at the beautiful Pelican Hill Resort. Sim and Aron held their festivities including a Sangeet, Baraat ceremony, Luncheon, Cocktail Hour, Grand Finale Reception followed by an after party. It was a perfect ending to an exquisite year! Photography by Duke Photography. From our family to yours, we wish you a warm, healthy and fabulous 2018! Happy New Years! Cheers! Guests had a few hours of down time at the conclusion of lunch and after the couple's send off. Most of them decided to go back to their rooms to rest up before the cocktail hour which was at 5:30 pm. Meanwhile the entire team was busy at work under Nikki's supervision. Bride had chosen midnight blue and gold for the cocktail area. Mar Vista Terrace was set up with a large circular custom surrounded by gold furniture vignettes. A riser covered with white carpet was placed behind the bar where string trio was going to entertain the guests. High and low cocktail tables in custom midnight blue linens with white flowers and candles were scattered all over. 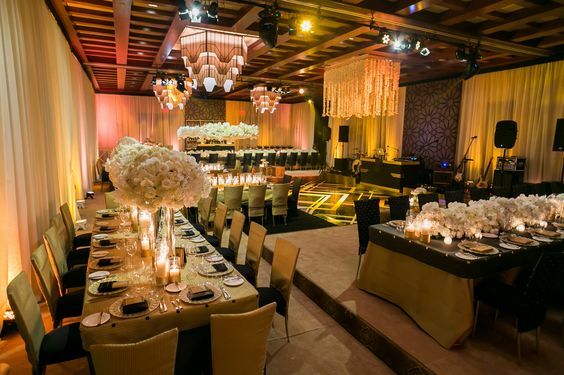 Two large gold mirrors bearing guests seating assignment were set up in plain sight. Lighting was done to perfection with the trees, up lights and bar lit up in deep blue color to pay homage to our groom's heritage. On the ceremony lawn, flip for dinner reception was fully underway. As soon as the holy book left the tent, the structure was moved to house the sweet heart table on the other side behind a flower wall back drop. A stage was set up to accommodate the twelve piece band across from the couple's sweet heart table. Large dance floor in ivory had couple's names in gold mimicking their invitations. Long and round tables were pushed in with rounds dressed in blush linens. There was a calm frenzy in the tent and all teams were working together in utmost harmony. Our Exquisite Events team was helping the hotel with placing the chargers, napkins and menus on the tables. Lighting was done to perfection in very subtle blush color and once flowers were placed on the tables and candles were lit, the tent was glowing like a jewel. A large circular bar sat under the imposing rotunda and another bar was set up close to the entrance of the tent to alleviate congestion. DJ' s booth sat outside the tent. To our surprise we were completely ready one hour prior to deadline so our couple could see the space in its splendor and also take photos. Guests arrived at 5:30 to enjoy the cocktail hour and were entertained by lovely music. Breaking of the glass signified guests moving to the tent for dinner where the band was playing enthralling music. Our couple made the grand entrance among thunderous applause and went straight to the dance floor for their first dance. The night was simply magical and weather could not have been more perfect. Guests enjoyed the decadent meal and dance floor remain packed in between courses. Couple cut the cake at 10 pm which indicated moving up to the Mar Vista Room for after party. This room was set up in merlot and burgundy custom furniture and coffee and end tables in gold accents. Large stage was set up for the band with DJ booth on the side. Assorted decadent desserts along with gelato and sliced wedding cake waited for guests to do them full justice. Coffee and tea stations were ready along with fully stocked custom bars. Gold dance floor with Merlot decal bearing couples names completed the cohesive look. The room looked like a sophisticated night club with tons of candles burning all over. Guests were surprised at the complete transformation of this space and need less o say partied like no other. The night lasted until the wee hours of the morning and guests were gifted a special soap wrapped up in blue paper and gold ribbon. They say all good things must come to an end and such was the case with this truly exquisite event. We wish our lovely couple life time of happiness and eternal bliss! Next morning on Saturday was a long day with bride’s make up starting at 5 am and groom’s turban tying at 7 am. 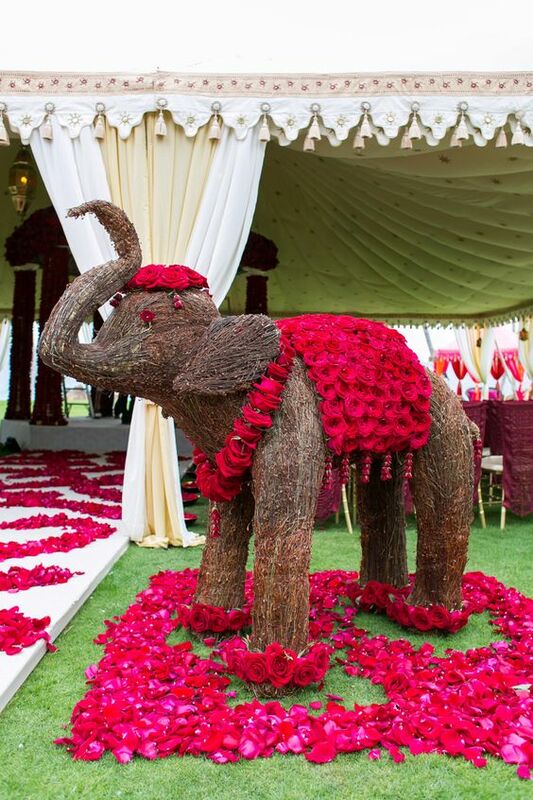 The elephant arrived in all its splendor at 8 am and Baraat started at 9 am. Special Baraat band had flown from New York and played upbeat Shadi tunes. It was quite a majestic and festive sight to see our groom sitting regally on top of the elephant. Milni took place right after a small prayer was said and guests were escorted for breakfast on the terrace. Ceremony set up was elegant and sophisticated under the tent on the lawn and guests were asked to make their way to the tent after breakfast. A shoe valet was provided from Pelican upon Nikki’s request and assisted guests in taking off their shoes and placing them behind the hedges. Raagis were singing religious hymns and after bowing to the Holy Book, ladies sat on one side of the tent while men sat on the other. Bride made her entrance to the tent which was an indication for ceremony to begin. According to Sikh tradition, ceremony has to conclude by 12 pm at which time guests made their way for lunch and couple was whisked away by the wedding butler for photos. Couple joined the guests right before the formal send off which was witnessed by all wedding guests. We wish our couple lifetime of happiness and eternal bliss! Stay tuned for cocktail hour, dinner reception and after party in next week blog. 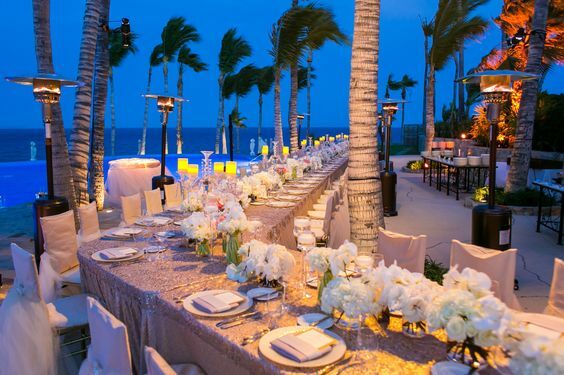 Our clients were in search of the perfect venue, from Palm Springs to Santa Barbara, San Diego to Cabo San Lucas, the decision was set on The Resort at Pelican Hill off the beautiful Newport Coast. One of the most extraordinary wedding locations with gorgeous views of the Pacific Ocean, impeccable service and the epitome of luxury, Pelican Hill exceeds any expectation. The Bungalow Lawn was chosen for the kick off Sangeet event, due to no other space available on that specific date. Nikki is always secretly concerned about an event being outdoors in November and also the fact no sub flooring was taken into account. Since her ultimate goal is to always provide that unparalleled experience for the couple, their families and the guests, this was something she was uneasy about. All the design elements and floor plan was based on the event being on bungalow lawn and it was decided that the after party was going to take place in one section of Mar Vista Ballroom from 10 o'clock onwards. 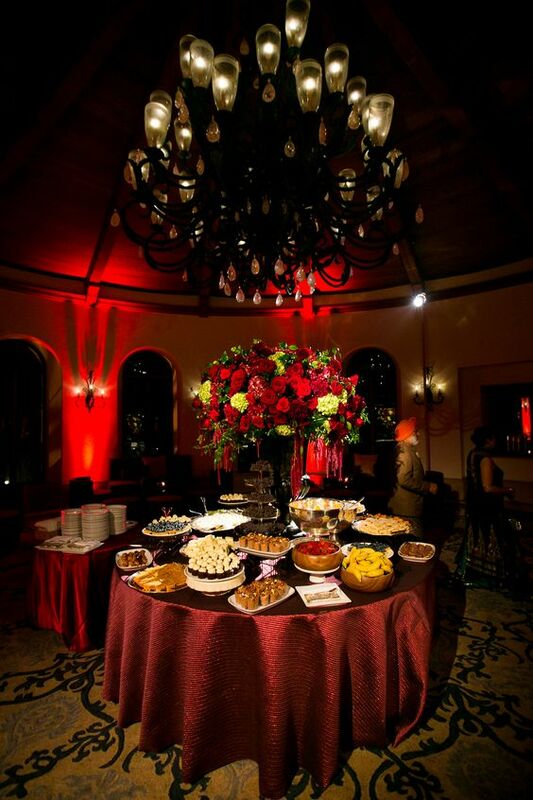 As event days drew near she reached out to Fernanda with Pelican Hill Weddings and voiced our concerns. It took Fernanda a few days and she was very understanding and kind enough to be able to move the existing group to another space. This was literally a few weeks before the event. 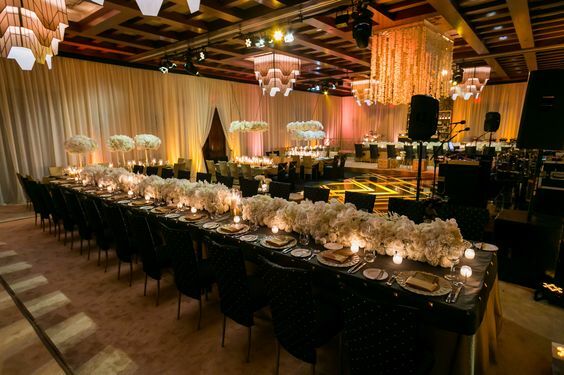 The team at Exquisite Events with Nikki at the forefront went back to the drawing board and a new floor plan was created to accommodate all 300 guests in the Mar Vista Ballroom. Now that the event was inside the ballroom it was perfect as guests could stay as long as they wished for the after party. Our bride loved jewel tone colors and chose red as the signature color for her Sangeet. 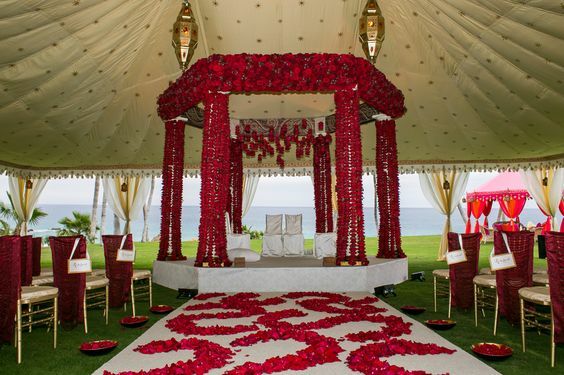 The ballroom was draped in deep red velvet fabric which looked absolutely regal. Gold tassels on the openings further added to the allure. Stage front pieces were custom made to match the swing that sat atop the stage for the couple. 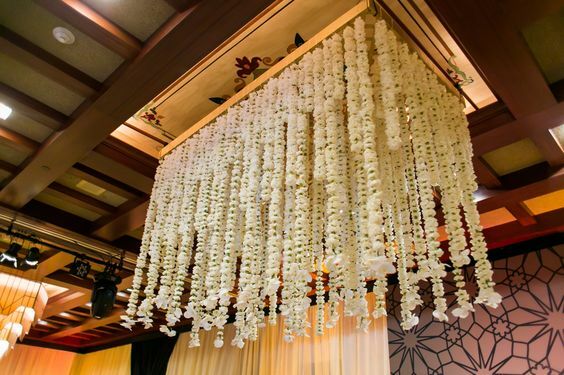 The backdrop was nothing less than jaw dropping with straight garlands in marigolds filling the entire space. Couple’s swing was decorated with marigolds as well and to add the oomph, Nikki decided to hang the gold Kaleeras on the swing. Dance floor pattern was chosen after much deliberation and research and definitely added to the “WOW” factor. Nikki had decided to use five pergolas from Raj Tents to house the bars and appetizers with two of them outside on the terrace. When the set up was complete with low furniture from Raj’s new collection the end result was pure magic. Mood lighting further enhanced the ambience and created an absolute romantic and elegant environment. Needless to say our client and their families were very pleased with the outcome. Bride and Groom made their entrances with pomp and circumstance and guests were entertained by professional dancers, delicious food, Mehndi ladies and a DJ that kept the guests busy on the dance floor. The festivities lasted until very late at night and our couple and their families departed a little early due to next morning events starting very early in the morning. Stay tuned for the Baraat + Ceremony next week. Next day was our meeting at 9 am at Paradise City Resort with the lighting vendor. All decor elements were discussed in great detail in the actual space with specs for custom structures and fabrication of various decor items. After a quick lunch, we said our goodbyes and headed to Seoul for our walk thru at the church where bride met us with a couple of her friends. After spending a few hours at the church, we were treated to a sumptuous dinner at a two Michelin star restaurant on the most fashionable street of Seoul. Further discussions on the timeline and design of the wedding was discussed with bride being directly involved. This was by far the most important and productive meeting and one could see the bride totally relaxed. Dinner lasted a few hours after which goodbyes were said and we left to check in to our hotel. Next day was again full of meetings but we managed to sneak some time to do some sightseeing. On my last day in Seoul we managed to go to the flower mart at 5 am to browse the aisles and not only determine the exact flowers we were planning to use at the wedding but also meet with a few vendors for custom wood structures. We got back to the hotel at 10 am for a quick breakfast and was then picked up by the driver at 11 am to take me to the airport for my 2 pm flight. Can’t wait to share this wedding with our readers in February.